In Part 1 of this series I laid out why IQ matters and that, far from being a banal measure of merely of how well some people do in a series of irrelevant tests, IQ actually has real power to predict people’s life chances. What seems incontrovertibly true is that a higher IQ leads to a better life. This could easily seem like a counsel of despair if it automatically meant that children with lower IQs lived shorter, less fulfilled lives. Thankfully, there is something we can do and in this post I want to show the effects education has on raising IQ. If you mean ‘Do our brains have more potential at conception than those of our ancestors?’ then we are not. If you mean ‘Are we developing mental abilities that allow us to better deal with the complexity of the modern world, including problems of economic development?’ then we are. One thing we can be fairly sure will help in “developing mental abilities that allow us to better deal with the complexity of the modern world” is school. For as long education has been mandatory, average IQs have been rising. As I showed in Part 1, education and intelligence have a two-way interaction: the more intelligent you are the longer you stay in school and the longer you stay in school, the more intelligent you become. To understand how we know this, we have to head back to 1960s Norway. The government of the day decided to mandate an additional two years of schooling for all children, but, as luck would have it, they made the decision to roll out the new policy over a number of years with some parts of the country lagging a few years behind other parts. As further piece of luck, young Norwegian men have to do a period of compulsory military service and – more luck – the Norwegian military gives an IQ test to all conscripts. This has meant that researchers can see the effects of the additional two years of schooling by comparing the average IQs of men from those parts of the country in which the new policy had been implemented with those parts in which it hadn’t. Each extra year of schooling accounted for 3.7 IQ points. (Brinch & Galloway 2012) If we extrapolate from this we can maybe assume that if you’re in education for 11 years, this will raise your IQ by over 40 points! When you consider that the average IQ is 100, this represents a phenomenal difference. Sadly, this isn’t something that’s ever been directly tested because it would require a large-scale randomised controlled trial in which some children were prevented from attending school. While many of the children I’ve taught over the years might have been willing to take part in such an experiment, I think most parents would balk at such an idea. We do however have the next best thing. Developmental psychologists, Sorel Cahan and Nora Cohen came up with a nifty experimental design that circumvented this problem. They used the fact that in a given school year children’s ages can vary by up to a year. My youngest daughter was born in August, right before the cut off date for the next academic year starting on September 1st. As a result, she’s very close in age to children who are a whole academic year behind her. In this way, Cahan and Cohen were able to measure the effects of a year’s schooling on children on roughly the same age’s IQ scores. They found the effects of education were twice as great as the effects of ageing. This finding has been confirmed by a number of subsequent studies. So, although we know education has a lasting effect on intelligence, we don’t know for sure what it is about education that causes the increase. This is important because if we knew which bits of schooling resulted in the most increases we could make sure we did more of what was most effective. For now though, just keeping children in school for as long as possible is likely to be beneficial without understanding exactly why. Although it might turn out to be something banal or unexpected, it’s most likely that education exposes children to more vocabulary and general knowledge than they might otherwise encounter. Education also exposes children to more of the kind of abstract reasoning which is measured in an IQ test than they would probably get in another environment. More evidence for the idea that we can all get cleverer comes from what’s become known as the Flynn effect. Back in the 1980s, intelligence researcher and political scientist, James Flynn noticed something peculiar about the way IQ tests are measured. Intelligence distributes normally across a population. 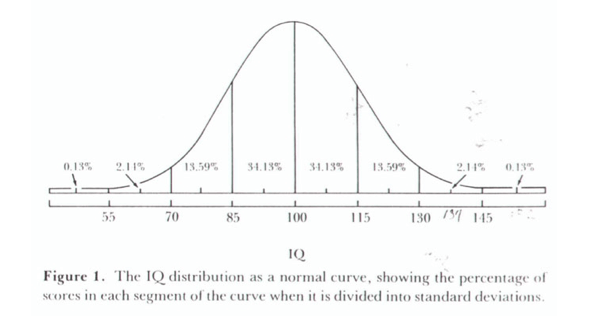 What this means is that you can represent the intelligence of a large enough group of people with a bell curve. 100 marks the average IQ, with 68% of people scoring within 15 points of the average mark and 96% within 30 points. If you’re in the top 2.1% you’re in genius territory and if you’re in the bottom 2.1% you’ll have trouble functioning in society. What Flynn noticed was that every now and then, IQ tests have had to be recalibrated to make sure 100 continues to represent the average score; it seemed as if the average seemed to be steadily increasing. In fact it’s been going up by about 3 points per decade ever since the earliest years of testing. On the face of it, this seems to suggest we’re all getting cleverer. In fact, if you scored 100 on an IQ test and were somehow able to go back in time fifty years, you’d have had an IQ of about 119. If you went back a hundred years, you’d have a score of over 130 – better than 98% of people alive at that time! And if that same time machine allowed an average person from a hundred years ago to travel forward to 2017, their IQ score would now indicate mental retardation. Clearly, it’s daft to suppose that majority of people in previous centuries were retarded, and it’s equally silly to think most people alive today are geniuses. There must be another explanation for the baffling finding. Various people have proposed various solutions to this enigma including the idea that test questions have become common knowledge or that we’ve just gotten better at taking tests with practice. Weirdly though, the biggest gains do not come from those questions that assess crystallized intelligence. Rather, the questions we seem to score better on are mainly tests of abstract reasoning such as similarities (What do caterpillars and tadpoles have in common? ), analogies (ALL is to MANY as ____ is to FEW) and visual matrices like the one we saw in Part 1. On the face of it this looks like the species is getting better at the kind of abstract reasoning which makes up fluid intelligence, although, it’s worth pointing out that the similarity and analogy questions may actually be testing crystallized intelligence; you have to know what each of the items are before you can do much in the way of reasoning. As you can see from the graph below, tests of general knowledge, vocabulary and mathematic ability haven’t risen nearly so much. Other studies have shown that while we might be getting smarter, we’re not getting any faster. In 1981, Nettlebeck & Wilson tested the vocabulary and processing speed of children aged between 6 and 13 in a school and then returned to the same school 20 years later to assess a different group of children with the same tests. The later generation had better vocabularies, but their ability the process information had not improved. Processing speed is clearly linked to working memory and working memory is closely correlated with fluid intelligence. Vocabulary is much more a function of our crystallized intelligence. This seems to confirm that we can raise one but not the other. To say the Flynn effect came as a surprise to the scientific community is something of an understatement. We’ve known for ages that intelligence is highly heritable and, for the most part, unaffected by upbringing. Twin and adoption studies have revealed that when identical twins – who share 100% of their genetic material – are adopted into different families, their IQ is pretty much the same, and when adopted siblings are raised in the same family as children with whom they share no genes, there is almost no connection between their IQ scores. The one thing we can be clear about from the Flynn effect is that it’s not caused by a change in our genes – evolution just doesn’t work that quickly. As Sherlock Holmes tells us, Once you’ve dismissed the impossible, whatever remain, not matter how improbable, must be true. So, if the rise in IQ isn’t down to changes in the human genome, it must be something to do with the modern environment. But what? Well, it might seem reasonable to suggest that improved education and nutrition have played a part, both are certainly correlated with rise in IQ, but no one is willing to accept they could account for a rise in 30 points over a century. Flynn believes the rise is due to a change in the way we’ve come to see the word. He says we’ve learned to see the world through ‘scientific spectacles’ and that the way we think has altered dramatically over the past century. In Are We Getting Smarter? Flynn recounts the research of the late, great Russian psychologist, Alexander Luria who tested Russian peasants with the sort of questions commonly asked in IQ tests. When they were asked what a horse and a dog had in common they answered that both were used in hunting, rather than classifying them both as mammals. Flynn takes this as evidence that our experience shapes the way we think; if we spend our lives thinking about practical concerns, such as where our next meal is coming from, then we’re much more likely to think in concrete terms about what immediately concerns us. But if we’re familiar with scientific taxonomy and the kind of abstract thinking required to operate a computer, then that is how we will have trained ourselves to think. Human beings have, Flynn argues, shifted from being people who thought in predominantly concrete terms about what in the immediate environment might benefit them, to people who think primarily in abstractions. It’s not that we’ve gotten cleverer; it’s more that we’ve improved at the kinds of thinking measured by IQ tests. You might think this is a bit of trick and just evidence that IQ test don’t actually measure anything important, but if you thought that, you’d be wrong. It turns out that the kind of thinking that allows us to do better on IQ scores has important real world applications. The ability to divide the world into scientifically useful classifications, think hypothetically and frame our thoughts in abstract, universal terms seems to lead to making better moral decisions. Obviously, this is not to say that everyone in the past was immoral, but it is in line with the incontrovertible fact that violence has declined hugely over time and that our chances of dying in a violent altercation are lower now than they have ever been in human history. Whilst very far from being perfect, our ability to tolerate differences in others and see the world from someone’s else’s perspective seems to be steadily increasing. As literacy and education increases, intolerance and violence decrease. Some scientists gave argued that the Flynn effect may be coming to an end. They point to the fact that the rise in IQ in undeveloped countries is far steeper than that in the developed world. 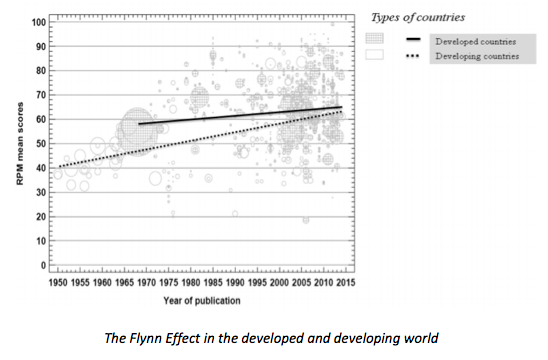 However, a recent review of the research suggests the Flynn effect shows no immediate signs of petering out even in the most developed countries. Whatever it is that’s causing it – and Flynn’s idea of ‘scientific spectacles’ is as good as any – it may be slowing down but it’s not going away. In summary, there are excellent reasons to believe we can all get cleverer than we are currently, but there are also lots of pit falls, false starts and no small amount of snake oil out there. If we’re genuinely interested in making kids cleverer our best bet is to focus on crystallized intelligence. As this is inextricably bound up with what we know, then teachers need a better understanding of what knowledge is and how to systematically increase it. In the final post in this series I will consider how we might go about raising the intellectual capacity of our students, thereby improving the likely quality of their lives. See for instance, Cliffordson and Gustafsson (2008) and Stelzl, Merz, Ehlers and Remer (1995). Thanks. I wonder if this is in any way connected to the French curriculum decisions that E.D. Hirsch writes about? dysgenic fertility – Is that having less children? The more recent meta-analysis (2014) I link to in the blog argues the reverse. The Norwegian evidence isn’t entirely convincing. The demographics of the areas where the school leaving age were first extended could conceivably account for some or even most of the differences, One can easily imagine the results of extending the school age in Cambridge before Hartlepool. A meta-analysis by Patricia Greenfield (2009) found that improvements in visual-spatial reasoning were accompanied by a decline in higher-order skills such as abstract vocabulary, inductive problem solving and critical thinking. A 2007 paper by Shayler, Ginsberg and Coe found that children’s understanding of basic scientific concepts (such as displacement) had dropped sharply. When Year 7 pupils were given two identically sized blocks—one made of plasticine and the other of brass—they were asked if the metal block would displace more than, less than or the same amount of water as the plasticine block. In 1976, 54% of boys and 27% of girls gave the correct answer; in 2003 the figure was 17% for both. This said, it certainly would be interesting if it were possible to track the IQ scores of Michaela’s pupils. 1. That’s an interesting point – I’ll ask some Norwegian contacts about the demographic differences of the different areas. But don’t you think Cahan & Cohen’s study is convincing? 2. I might be wrong, but isn’t Greenfield a bit of a crank? 3. Scientific knowledge is very different from Flynn’s scientific spectacles’: just because you’re more familiar with viewing the world in a more abstract way doesn’t mean you’re going to be any more knowledgeable about displacement. Flynn himself rails against a dumbed down culture where young people have better reasoning power but lack the information to reason with. 4. It *is* possible to track the IQ of Michaela’s students. We just need to get some intelligence researcher interested in such a project. 1. Insofar as schooling improves crystallised intellingence, I have no problem with Cahan & Cohen or indeed the Norwegian study. However, simply not having mummy around means that the child will have think a lot more about what’s going on and figure out how to attract the attention of a new care-provider and how to manipulate her. And how to deal with all those strange kiddies–something I recall vividly after all these years. 2. Greenfield says a lot of unpopular things–such as blowing the whistle on VAK–but I don’t think her warnings about the way digital toys are changing kids’ brains are that wide of the mark. Compared to revered educators like Dylan Wiliam, she’d a model of intellectual probity. 3. Never had a problem with Flynn, but displacement is a pretty simple concept. 4. Let’s just hope! I’m not sure how many researchers would have the guts to stand up to the inevitable howls of protest. Displacement is relatively simple but it still needs to be taught. A larger battery of comparisons would be informative. What specific examples of issues with Dylan William do you have? His work is very much utilized and it would help me assess its worth. True, Dylan readily admits this (though he has also condoned some activities I can’t see the relevance of). I read the original black-box paper and a follow up and it made a lot of sense. It also had little relevance to how people implement it. Are you critiquing his research (I have limited knowledge of this) or the implementation and understanding of AfL (In which case we agree)? Goldacre was critiquing Susan Greenfield, not Patricia. Agree AfL is a pain, and success criteria a load of nonsense for the most part (I used to fill in little boxes for this, they had no real relevant reference to what children actually did – it was not overburdensome as I was a ESL teacher, not dealing with 10 classes of 30 children etc). But not sure teachers welcome ‘objective’ tests either – received wisdom seems still to be a) any test is a bad test and involves ‘teaching to the test’ and b) skills are more important than knowledge (the Google effect). Hope someone tells me I am wrong. Granted, a lot of teachers won’t welcome tests, especially if they are of an ideological bent. In the secondary sector, relatively few teachers have had the extensive indoctrination that most primary teachers receieve in ITT, and very often they can be easily persuaded, especially now that GCSEs reflect a much greater emphasis on knowledge. Once converted, they seldom revert. It really does have a transformative effect–kids love tests when the learning objective is clear and unambiguous. Given half a chance, they really are competitive little sods. This said, it would be a grave error to impose tests on unwilling teachers. The best way to kill a good idea stone dead is to force someone to accept it. Ceci (1991) concluded “the conclusion seems fairly clear: Even though many factors are responsible for individual and group differences in the intellectual development of children, schooling emerges as an extremely important source of variance, notwithstanding historical and contemporary claims to the contrary”. Ceci, S. J. (1991). How much does schooling influence general intelligence and its cognitive components? A reassessment of the evidence. Developmental psychology, 27(5), 703-722. 1) Twin studies show that intelligence is highly genetic. 2) Evolution happens over thousands of years. 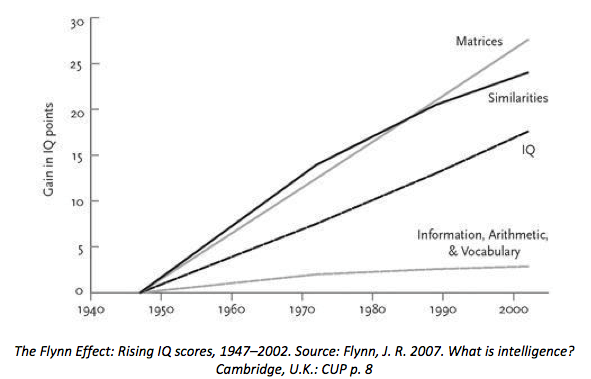 3) The Flynn effect shows that IQ has increased over the last century. 4) 2 and 3 mean the Flynn effect is environmental. 5) Environments that children are raised in are very different. 6) Identical twins raised separately will have different environments but according to 1 have similar IQs. 1. Yes, twin and adoption studies make it clear that intelligence is partly heritable (along with every other trait) with estimates ranging from 50-80% heritability. Clearly this means that 30-50% of intelligence is down to the environment. 5. Yes. If environments were the same then differences between individuals would be 100% heritable. 6. Yes. And adopted siblings show no correlation in IQ. I think you’re problem might be two-fold. First, environment is not the same as “raising”. Shared environment (what two siblings have both experienced i.e. parenting) has not lasting effect on any adult traits. The reason we’re similar to our parents is because we share their genes. Non-shared environment (peer groups & schooling) is far more influential. So broadly, a trait like intelligence (as measured by IQ) will be attributal like so: Heritability – 50-80%. Non-shared environment 20-50%. Shared environment – 0%. So from this we can see that while intelligence is highly heritable, some of it (maybe as much as half) is always attributed to our environment. The Flynn effect cannot be down to biology so it *must* be accounted for in this 20-50% which is due to environment. Flynn’s argument is that the way we view the world has radically changed over the past 100 years and that as a result we are better at the types of thinking measured in IQ tests. Although our IQs have increased, our intelligence hasn’t. Instead we’re better at hypothetical reasoning, logical puzzles and thinking in abstractions. I am willing to accept that it is a little bit nature, a little bit nurture. This seems to be a sensible position to take. The exact percentages are difficult to evaluate are there is so much complexity and inter-relatedness. So why do, ” identical twins – who share 100% of their genetic material – are adopted into different families, their IQ is pretty much the same, ” surely their IQs should only be 50 – 80% the same? I guess it comes down to what you think is pretty much the same but I would say, and maybe it is because I am a mathematician, it is more than 50-80%. On the point that you mention about parenting having no long lasting effect, are you saying for example that reading to my kid before bedtime will have no effect on their intelligence? I choose what to read and for how long for, so I am altering their environment. I would see “raising” as a way of changing the environment for the child. Surely I bring more to the party than just my sperm. Also, if hypothetical reasoning, answering logical puzzles and thinking in abstractions are not part of our intelligence what are they part of? I’d be interested to hear more about how this relates to ideas about skills being largely non-transferrable. If the Flynn 2007 graph shows that ‘information’ etc performance hasn’t improved much, how could our ability to think abstractly have improved so much? Wouldn’t we need more knowledge on which to build the abstractions? Maybe I’m missing something or haven’t read carefully enough! Flynn attributes the rises to familiarity with abstraction afforded by exposure to what he calls ‘scientific spectacles’. Whilst we have tended to think about Raven’s progressive matrices, for instance, as entirely measuring Gf, it seem pretty clear that the must be an element – a possibly a rather strong one – of Gc behind thinking of the world in abstractions. It is this that appears to be increasing. This is fascinating! I had been wondering whether the Flynn effect was still in operation; I’d come across some articles that intimated that the gains in learning ability that had happened over the past several decades were actually reversing. I must say, though, that the terms ‘mental retardation’ and ‘retarded’ are outdated and offensive; the currently accepted terms are ‘intellectual disability’ or ‘(global) learning disability/difficulties’, depending on where you are. Since you’re in the UK, it’s likely you’ll find material from organisations like Mencap that refer to learning disability; North American and Australian educators and psychologists are more likely to say ‘intellectual disability’. In any case, please consider changing the terms used within your article to be less pejorative towards people who take substantially longer than the general population to learn.